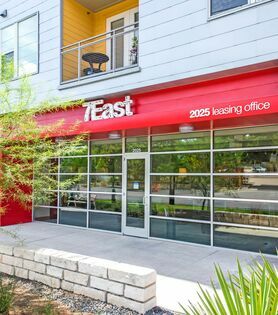 Overlooking the eclectic suburb of East Austin, 7East raises the standard for luxury living. Decked out with elegant features and high-tech details in each home this mid-rise apartment community offers an unbeatable living experience. 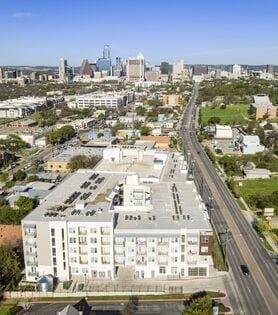 Combined with an ideal location near Austin’s most notable attractions, you’re bound to discover the authentic charm of the city. 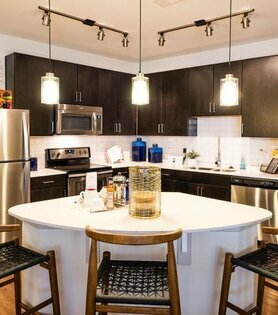 Come home to a modern studio, one or two bedroom apartment exuding comfort and class. Sophisticated features, like nine- or ten-foot ceilings and vinyl wood flooring, catch your attention from the moment you step through the front door. Stainless steel appliances and quartz countertops beam under upscale lighting while custom cabinetry adds a touch of convenience to the kitchen. Other interior features include walk-in closets, electronic-keyed entry, and NEST thermostats. Within the walls of the community’s modern architecture, 7East provides impeccable amenities and services. 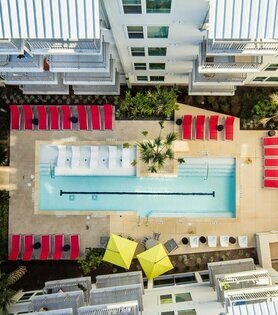 Admire the view of the Texas sunset or the downtown skyline from the Skylounge, a rooftop patio with grilling stations. Keep cool at the pool surrounded by lounge chairs and shady palm trees, or take your furry friend for an afternoon at the spacious leash-free bark park. Contact a 7East staff member for more information.